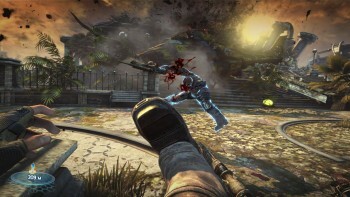 The Bulletstorm PC demo is finally out on Steam and Games for Windows Live. Not a whole lot to say about this one except that the demo for the PC version of Bulletstorm, which was teased and then yoinked away back in February, is finally here. The demo came out for the Xbox 360 and PlayStation 3 in January but those of us in the mouse-and-keyboard demographic had to wait another full month just to find out whether we'd get a crack at it at all. Bulletstorm launched 42 days ago, which I'm not sure really counts as the "shortly after" release that Epic Vice President Mark Rein promised on Twitter, but it's close enough. Better late than never and all that. The Bulletstorm demo is available now on Steam and the Games for Windows Marketplace; what portions of the game it covers isn't made clear but it's probably a safe bet that bad language, boots to the junk and creative mayhem punctuated by copious amounts of blood will figure prominently.